This article is about the character. For the various films with the same name, see King Kong (1933 film), King Kong (1976 film), and King Kong (2005 film). For other uses, see King Kong (disambiguation). King Kong is a giant movie monster, resembling an enormous gorilla, that has appeared in various media since 1933. The character first appeared in the 1933 film King Kong from RKO Pictures, which received universal acclaim upon its initial release and re-releases. A sequel quickly followed that same year with The Son of Kong, featuring Little Kong. In the 1960s, Toho produced King Kong vs. Godzilla (1962), pitting a larger Kong against Toho's own Godzilla, and King Kong Escapes (1967), based on The King Kong Show (1966–1969) from Rankin/Bass Productions. In 1976, Dino De Laurentiis produced a modern remake of the original film directed by John Guillermin. A sequel, King Kong Lives, followed a decade later featuring a Lady Kong. Another remake of the original, this time set in 1933, was released in 2005 from filmmaker Peter Jackson. The most recent film, Kong: Skull Island (2017), set in 1973, is part of Legendary Entertainment's MonsterVerse, which began with Legendary's reboot of Godzilla in 2014. A crossover sequel, Godzilla vs. Kong, once again pitting the characters against one another, is currently planned for 2020. The character King Kong has become one of the world's most famous movie icons, having inspired a number of sequels, remakes, spin-offs, imitators, parodies, cartoons, books, comics, video games, theme park rides, and a stage play. His role in the different narratives varies, ranging from a rampaging monster to a tragic antihero. King Kong graphics at Empire State Building. The King Kong character was conceived and created by American filmmaker Merian C. Cooper. In the original film, the character's name is Kong, a name given to him by the inhabitants of "Skull Island" in the Indian Ocean, where Kong lives along with other oversized animals such as a plesiosaur, pterosaurs and various dinosaurs. An American film crew, led by Carl Denham, captures Kong and takes him to New York City to be exhibited as the "Eighth Wonder of the World". Kong escapes and climbs the Empire State Building, only to fall from the skyscraper after being attacked by airplanes with guns. Denham comments "it wasn't the airplanes, It was beauty killed the beast," for he climbs the building in the first place only in an attempt to protect Ann Darrow, an actress originally offered up to Kong on Skull Island as a sacrifice (in the 1976 remake, her character is named "Dwan"). A documentary about Skull Island that appears on the DVD for the 2005 remake (originally seen on the Sci-Fi Channel at the time of its theatrical release) gives Kong's scientific name as Megaprimatus kong ("Megaprimatus", deriving from the prefix "mega-" and the Latin words "primate" and "primatus", means "big primate" or "big supreme being") and states that his species may be related to Gigantopithecus, though that genus of giant ape is more closely related to orangutans than to gorillas. Merian C. Cooper glances up at his creation. Merian C. Cooper became fascinated by gorillas at the age of 6. In 1899, he was given a book from his uncle called Explorations and Adventures in Equatorial Africa. The book (written in 1861), chronicled the adventures of Paul Du Chaillu in Africa and his various encounters with the natives and wildlife there. Cooper became fascinated with the stories involving the gorillas, in particular, Du Chaillu's depiction of a particular gorilla known for its "extraordinary size", that the natives described as "invincible" and the "King of the African Forest". When Du Chaillu and some natives encountered a gorilla later in the book he described it as a "hellish dream creature" that was "half man, half beast". These stories planted the seed of adventure in young Merian's mind. Decades later in his adult years, Cooper became involved in the motion picture industry. While filming The Four Feathers in Africa, he came into contact with a family of baboons. This gave him the idea to make a picture about primates. A year later when he got to RKO, Cooper wanted to film a "terror gorilla picture". As the story was being fleshed out, Cooper decided to make his gorilla giant sized. Cooper stated that the idea of Kong fighting warplanes on top of a building came from him seeing a plane flying over the New York Insurance Building, then the tallest building in the world. He came up with the ending before the rest of the story as he stated, "Without any conscious effort of thought I immediately saw in my mind's eye a giant gorilla on top of the building". Cooper also was influenced by Douglas Burden's accounts of the Komodo Dragon, and wanted to pit his terror gorilla against dinosaur-sized versions of these reptiles, stating to Burden, "I also had firmly in mind to giantize both the gorilla and your dragons to make them really huge. However I always believed in personalizing and focusing attention on one main character and from the very beginning I intended to make it the gigantic gorilla, no matter what else I surrounded him with". Around this time, Cooper began to refer to his project as a "giant terror gorilla picture" featuring "a gigantic semi-humanoid gorilla pitted against modern civilization. Once the film got green-lit and it came time to design King Kong, Cooper wanted him to be a nightmarish gorilla monster. As he described him in a 1930 memo, "His hands and feet have the size and strength of steam shovels; his girth is that of a steam boiler. This is a monster with the strength of a hundred men. But more terrifying is the head—a nightmare head with bloodshot eyes and jagged teeth set under a thick mat of hair, a face half-beast half-human". 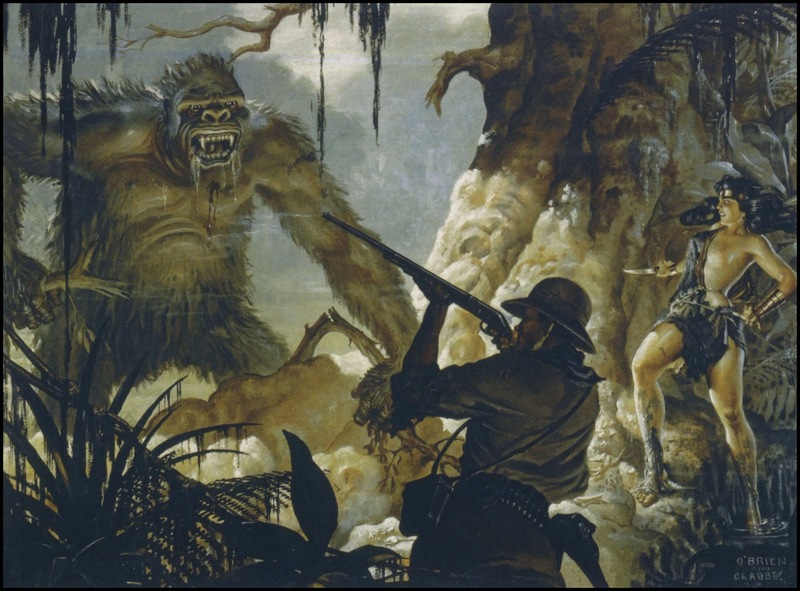 Willis O'Brien created an oil painting depicting the giant gorilla menacing a jungle heroine and hunter for Cooper. However, when it came time for O'Brien and Marcel Delgado to sculpt the animation model, Cooper decided to backpedal on the half-human look for the creature and became adamant that Kong be a gorilla. O'Brien on the other hand, wanted him to be almost human-like to gain audience empathy, and told Delgado to "make that ape almost human". Cooper laughed at the end result saying that it looked like a cross between a monkey and a man with very long hair. For the second model, O'Brien again asked Delgado to add human features but to tone it down somewhat. The end result (which was rejected) was described as looking like a missing link. Disappointed, Cooper stated, "I want Kong to be the fiercest, most brutal, monstrous damned thing that has ever been seen!" On December 22, 1931, Cooper got the dimensions of a bull gorilla from the American Museum of Natural History telling O'Brien, "Now that's what I want!" When the final model was created (one that Cooper ultimately approved of), it had the basic overall look of a gorilla but managed to retain some humanesque qualities, such as a streamlined body and a removed paunch and rump, distinctive aspects of the gorilla's anatomy that Delgado purposefully removed. O'Brien would incorporate some characteristics and nuances of an earlier creature he had created in 1915 for the silent short The Dinosaur and the Missing Link into the general look and personality of Kong, even going as far as to refer to the creature as "Kong's ancestor". When it came time to film, Cooper agreed that Kong should walk upright at times (mostly in the New York sequences) in order to appear more intimidating. Merian C. Cooper was very fond of strong, hard-sounding words that started with the letter "K". Some of his favorite words were "Komodo", "Kodiak" and "Kodak". When Cooper was envisioning his giant terror gorilla idea, he wanted to capture a real gorilla from the Congo and have it fight a real Komodo dragon on Komodo island. (This scenario would eventually evolve into Kong's battle with the tyrannosaur on Skull Island when the film was produced a few years later at RKO.) Cooper's friend Douglas Burden's trip to the island of Komodo and his encounter with the Komodo dragons was a big influence on the Kong story. Cooper was fascinated by Burden's adventures as chronicled in his book Dragon Lizards of Komodo where he referred to the animal as the "King of Komodo". It was this phrase along with "Komodo" and "Kongo" [sic] (and his overall love for hard sounding "K"-words) that gave him the idea to name the giant ape "Kong". He loved the name, as it had a "mystery sound" to it (not realizing, probably, that "kong" is the Danish word for "king"). When Cooper got to RKO and wrote the first draft of the story, it was simply referred to as "The Beast". RKO executives were unimpressed with the bland title. David O. Selznick suggested Jungle Beast as the film's new title, but Cooper was unimpressed and wanted to name the film after the main character. He stated he liked the "mystery word" aspect of Kong's name and that the film should carry "the name of the leading mysterious, romantic, savage creature of the story" such as with Dracula and Frankenstein. 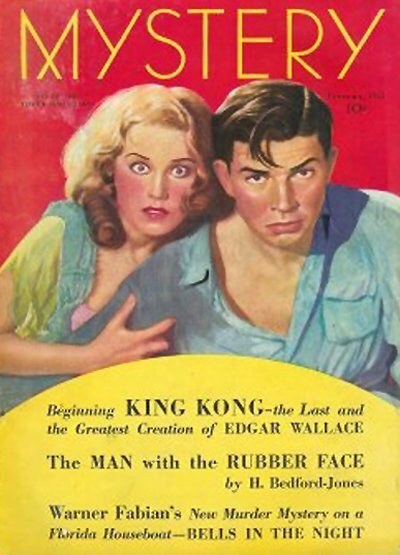 RKO sent a memo to Cooper suggesting the titles Kong: King of Beasts, Kong: The Jungle King, and Kong: The Jungle Beast, which combined his and Selznick's proposed titles. As time went on, Cooper would eventually name the story simply Kong while Ruth Rose was writing the final version of the screenplay. Because David O. Selznick thought that audiences would think that the film, with the one word title of Kong, would be mistaken as a docudrama like Grass and Chang, which were one-word titled films that Cooper had earlier produced, he added the "King" to Kong's name to differentiate it. July 22, 1967 (1967-07-22) Ishirō Honda Arthur Rankin Jr. Kaoru Mabuchi Tomoyuki Tanaka and Arthur Rankin Jr.
March 10, 2017 (2017-03-10) Jordan Vogt-Roberts John Gatins Dan Gilroy, Max Borenstein, and Derek Connolly Thomas Tull, Jon Jashni, Alex Garcia and Mary Parent Warner Bros. In mid-2012, it was announced that a musical adaptation of the story (endorsed by Merian C. Cooper's estate) was going to be staged in Melbourne at the Regent Theatre. The show premiered on June 15, 2013 as King Kong The Eighth Wonder of The World, with music by Marius De Vries. The musical then premiered on Broadway in November 8 of 2018 at the Broadway Theatre as King Kong Alive on Broadway. The creative team included book writer Jack Thorne, director-choreographer Drew McOnie, and Australian songwriter Eddie Perfect, who replace the former creatives. Cover of the 1932 novelization of King Kong written by Delos W. Lovelace. This novelization was released just over two months before the film premiered in New York City on March 7, 1933. "From what I know, Edgar Wallace, a famous writer of the time, died very early in the process. Little if anything of his ever appeared in the final story, but his name was retained for its saleability ... King Kong was Cooper's creation, a fantasy manifestation of his real life adventures. As many have mentioned before, Cooper was Carl Denham. His actual exploits rival anything Indiana Jones ever did in the movies." This conclusion about Wallace's contribution was verified in the book The Making of King Kong, by Orville Goldner and George E. Turner (1975). Wallace died of pneumonia complicated by diabetes on February 10, 1932, and Cooper later said, "Actually, Edgar Wallace didn't write any of Kong, not one bloody word...I'd promised him credit and so I gave it to him" (p. 59). Cooper issued a reprint of the novelization in 1965 that was published by Bantam Books. Some time later the copyright expired and the publishing rights to the book fell into the public domain. Since then a myriad of publishers have reprinted the novelization numerous times. Blackstone Audio produced an audio recording of the book in 2005 narrated by Stefan Rudnicki, while StarWarp Concepts released an Ebook version complete with 6 new illustrations from pulp-comic artist Paul Tuma in 2017. Outside of the novelization, the film was serialized in a pulp magazine. In 1933, Mystery magazine published a King Kong serial under the byline of Edgar Wallace, and written by Walter F. Ripperger. This serialization was published in two parts in the February and March issues of the magazine. In the U.K, the film was serialized in 2 different pulps both on October 28, 1933. In the juvenile Boys Magazine (Vol 23. No. 608). where the serialization was uncredited, and in that month's issue of Cinema Weekly where it was credited to Edgar Wallace and written by Draycott Montagu Dell (1888–1940). This short story adaptation would later appear in the Peter Haining book called Movie Monsters in 1988, published by Severn House in the UK. In 1977, a novelization of the 1976 remake of King Kong was published by Ace Books. This novelization was called The Dino De Laurentiis Production of King Kong and was simply the 1976 Lorenzo Semple Jr. script published in book form. The cover was done by Frank Frazetta. In 1994 Anthony Browne wrote and illustrated a book called Anthony Browne's King Kong. Credited as "From the Story Conceived by Edgar Wallace & Merian C. Cooper", the book was published by the Turner Publishing Company. It was re-released as a paperback in the U.K in 2005 by Picture Corgi. To coincide with the 2005 remake of King Kong, various books were released to tie into the film. A novelization was written by Christopher Golden based on the screenplay by Fran Walsh, Philippa Boyens, and Peter Jackson. Matt Costello wrote an official prequel to the film called King Kong: The Island of the Skull. These books were published by Pocket Books. Various illustrated juvenile books were published, as well, by Harper Books: Kong's Kingdom was written by Julia Simon-Kerr; Meet Kong and Ann and Journey to Skull Island were written by Jennifer Franz; Escape from Skull Island and Kong: The Eighth Wonder of the World—Junior Novel were written by Laura J. Burns; The Search for Kong was written by Catherine Hapka; and finally, a Deluxe Sound Storybook of Kong: The Eighth Wonder of the World was written by Don Curry. Weta Workshop released a collection of concept art from the film entitled The World of Kong: A Natural History of Skull Island that was published by Pocket Books. The book was written and designed to resemble and read like an actual nature guide and historical record. In 2005, Ibooks, Inc., published an unofficial book featuring King Kong called Kong Reborn by Russell Blackford. Starting in 2004, artist/writer Joe Devito began working with the Merian C. Cooper estate to write and/or illustrate various books based on the King Kong character. The first of these was an origin story labeled as an authorized sequel/prequel to the 1932 novelization of King Kong called Kong: King of Skull Island. This illustrated hardcover novel was published in 2004 by DH Press and featured a story Devito co-wrote with Brad Strickland and John Michlig. It also included an introduction by Ray Harryhausen. A large-paperback edition was then released in 2005, with extra pages at the end of the book. As well, a CD audiobook narrated by Joey D'Auria was released by RadioArchives, and an interactive two-part app was released in 2011 and 2013 respectively by Copyright 1957 LLC. In 2005, DeVito and Strickland co-wrote another book together called Merian C. Cooper's King Kong for the Merian C. Cooper Estate. This book was published by St. Martin's Press. It was a full rewrite of the original 1932 novelization, which updates the language and paleontology and adds five new chapters. Some additional elements and characters tie into Kong: King of Skull Island enabling the two separate books to form a continuous storyline. In 2013, the first of two books featuring crossovers with pulp heroes was published. To coincide with the 80th anniversary of both King Kong and Doc Savage, Altus Press published Doc Savage: Skull Island in both softcover and hardcover editions. This officially sanctioned book was written by Will Murray and based on concepts by DeVito. In 2016, Altus Press published the other crossover book, this time featuring a meeting between King Kong and Tarzan. The novel, called King Kong vs. Tarzan, was once again written by Will Murray and featured artwork by Devito. In 2018, a new book featuring another origin story written and illustrated by Devito was released called King Kong of Skull Island. In March 2017, to coincide with the release of Kong: Skull Island, Titan Books released a novelization of the film written by Tim Lebbon and a hardcover book The Art and Making of Kong: Skull Island by Simon Ward. Over the decades, there have been numerous comic books based on King Kong by various comic-book publishers. For details on this aspect of the character's print media appearances see King Kong (comics). In his first appearance in King Kong (1933), Kong was a gigantic prehistoric ape, or as RKO's publicity materials described him, "A prehistoric type of ape." While gorilla-like in appearance, he had a vaguely humanoid look and at times walked upright in an anthropomorphic manner. Indeed, Carl Denham describes him as being "neither beast nor man". Like most simians, Kong possesses semi-human intelligence and great physical strength. Kong's size changes drastically throughout the course of the film. While creator Merian C. Cooper envisioned Kong as being "40 to 50 feet tall", animator Willis O'Brien and his crew built the models and sets scaling Kong to be only 18 feet (5.5 m) tall on Skull Island, and rescaled to be 24 feet (7.3 m) tall in New York. 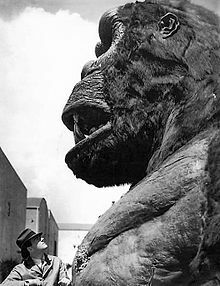 This did not stop Cooper from playing around with Kong's size as he directed the special effect sequences; by manipulating the sizes of the miniatures and the camera angles, he made Kong appear a lot larger than O'Brien wanted, even as large as 60 feet (18.3 m) in some scenes. I was a great believer in constantly changing Kong's height to fit the settings and the illusions. He's different in almost every shot; sometimes he's only 18 feet tall and sometimes 60 feet or larger. This broke every rule that O'Bie and his animators had ever worked with, but I felt confident that if the scenes moved with excitement and beauty, the audience would accept any height that fitted into the scene. For example, if Kong had only been 18 feet high on the top of the Empire State Building, he would have been lost, like a little bug; I constantly juggled the heights of trees and dozens of other things. The one essential thing was to make the audience enthralled with the character of Kong so that they wouldn't notice or care that he was 18 feet high or 40 feet, just as long as he fitted the mystery and excitement of the scenes and action. Concurrently, the Kong bust made for the film was built in scale with a 40-foot (12.2 m) ape, while the full sized hand of Kong was built in scale with a 70-foot (21.3 m) ape. Meanwhile, RKO's promotional materials listed Kong's official height as 50 feet (15.2 m). In the 1960s, Toho Studios from Japan licensed the character for the films King Kong vs Godzilla and King Kong Escapes. For more details on these versions of the character see below. In 1975, Italian producer Dino De Laurentiis paid RKO for the remake rights to King Kong. This resulted in King Kong (1976). This Kong was an upright walking anthropomorphic ape, appearing even more human-like than the original. Also like the original, this Kong had semi-human intelligence and vast strength. In the 1976 film, Kong was scaled to be 42 feet (12.8 m) tall on Skull island and rescaled to be 55 feet (16.8 m) tall in New York. Ten years later, Dino De Laurentiis got the approval from Universal to do a sequel called King Kong Lives. This Kong had more or less the same appearance and abilities, but tended to walk on his knuckles more often and was enlarged, scaled to 60 feet (18.3 m). We assumed that Kong is the last surviving member of his species. He had a mother and a father and maybe brothers and sisters, but they’re dead. He's the last of the huge gorillas that live on Skull Island ... when he goes ... there will be no more. He's a very lonely creature, absolutely solitary. It must be one of the loneliest existences you could ever possibly imagine. Every day, he has to battle for his survival against very formidable dinosaurs on the island, and it's not easy for him. He's carrying the scars of many former encounters with dinosaurs. I’m imagining he's probably 100 to 120 years old by the time our story begins. And he has never felt a single bit of empathy for another living creature in his long life; it has been a brutal life that he's lived. The thing that most interested me was, how big do you need to make [Kong], so that when someone lands on this island and doesn’t believe in the idea of myth, the idea of wonder – when we live in a world of social and civil unrest, and everything is crumbling around us, and technology and facts are taking over – how big does this creature need to be, so that when you stand on the ground and you look up at it, the only thing that can go through your mind is: "That's a god!" We sort of went back to the 1933 version in the sense that he’s a bipedal creature that walks in an upright position, as opposed to the anthropomorphic, anatomically correct silverback gorilla that walks on all fours. Our Kong was intended to say, like, this isn’t just a big gorilla or a big monkey. This is something that is its own species. It has its own set of rules, so we can do what we want and we really wanted to pay homage to what came before…and yet do something completely different, and If anything, our Kong is meant to be a throwback to the ’33 version. I don’t think there’s much similarity at all between our version and Peter [Jackson]’s Kong. That version is very much a scaled-up silverback gorilla, and ours is something that is slightly more exaggerated. A big mandate for us was, How do we make this feel like a classic movie monster? Co-producer Mary Parent also stated that Kong is still young and not fully grown as she explains, "Kong is an adolescent when we meet him in the film; he's still growing into his role as alpha". While one of the most famous movie icons in history, King Kong's intellectual property status has been questioned since his creation, featuring in numerous allegations and court battles. The rights to the character have always been split up with no single exclusive rights holder. Different parties have also contested that various aspects are public domain material and therefore ineligible for copyright status. 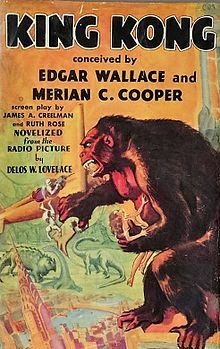 When Merian C. Cooper created King Kong, he assumed that he owned the character, which he had conceived in 1929, outright. Cooper maintained that he had only licensed the character to RKO for the initial film and sequel but had otherwise owned his own creation. In 1935, Cooper began to feel something was amiss when he was trying to get a Tarzan vs. King Kong project off the ground for Pioneer Pictures (where he had assumed management of the company). After David O. Selznick suggested the project to Cooper, the flurry of legal activity over using the Kong character that followed—Pioneer had become a completely independent company by this time and access to properties that RKO felt were theirs was no longer automatic—gave Cooper pause as he came to realize that he might not have full control over this product of his own imagination. My hassle is about King Kong. I created the character long before I came to RKO and have always believed I retained subsequent picture rights and other rights. I sold to RKO the right to make the one original picture King Kong and also, later, Son of Kong, but that was all. Cooper and his legal team offered up various documents to bolster the case that Cooper owned King Kong and had only licensed the character to RKO for two films, rather than selling him outright. Many people vouched for Cooper's claims including David O. Selznick, who had written a letter to Mr. A. Loewenthal of the Famous Artists Syndicate in Chicago in 1932 stating (in regard to Kong), "The rights of this are owned by Mr. Merian C. Cooper." But Cooper had lost key documents through the years (he discovered these papers were missing after he returned from his World War II military service) such as a key informal yet binding letter from Mr. Ayelsworth (then president of the RKO Studio Corp.) and a formal binding letter from Mr. B. B. Kahane (the current president of RKO Studio Corp.) confirming that Cooper had only licensed the rights to the character for the two RKO pictures and nothing more. For the sake of the record, I wish to state that I am not in negotiation with you or Mr. Cooper or anyone else to define Mr. Cooper's rights in respect of King Kong. His rights are well defined, and they are non-existent, except for certain limited publication rights. It seems my hassle over King Kong is destined to be a protracted one. They'd make me sorry I ever invented the beast, if I weren't so fond of him! Makes me feel like Macbeth: "Bloody instructions which being taught return to plague the inventor." The rights over the character did not flare up again until 1975, when Universal Studios and Dino De Laurentiis were fighting over who would be able to do a King Kong remake for release the following year. De Laurentiis came up with $200,000 to buy the remake rights from RKO. When Universal got wind of this, they filed a lawsuit against RKO claiming that they had a verbal agreement from them regarding the remake. During the legal battles that followed, which eventually included RKO countersuing Universal, as well as De Laurentiis filing a lawsuit claiming interference, Colonel Richard Cooper (Merian's son and now head of the Cooper estate) jumped into the fray. However, on December 6, 1976, Judge Real made a subsequent ruling, which held that all the rights in the name, character, and story of King Kong (outside of the original film and its sequel) belonged to Merian C. Cooper's estate. This ruling, which became known as the "Cooper Judgment," expressly stated that it would not change the previous ruling that publishing rights of the novel and serialization were in the public domain. It was a huge victory that affirmed the position Merian C. Cooper had maintained for years. Shortly thereafter, Richard Cooper sold all his rights (excluding worldwide book and periodical publishing rights) to Universal in December 1976. In 1980 Judge Real dismissed the claims that were brought forth by RKO and Universal four years earlier and reinstated the Cooper judgement. RKO owned the rights to the original film and its sequel. The Dino De Laurentiis company (DDL) owned the rights to the 1976 remake. Richard Cooper owned worldwide book and periodical publishing rights. The judge then ruled that "Universal thus owns only those rights in the King Kong name and character that RKO, Cooper, or DDL do not own." First, Universal knew that it did not have trademark rights to King Kong, yet it proceeded to broadly assert such rights anyway. This amounted to a wanton and reckless disregard of Nintendo's rights. Second, Universal did not stop after it asserted its rights to Nintendo. It embarked on a deliberate, systematic campaign to coerce all of Nintendo's third party licensees to either stop marketing Donkey Kong products or pay Universal royalties. Finally, Universal's conduct amounted to an abuse of judicial process, and in that sense caused a longer harm to the public as a whole. Depending on the commercial results, Universal alternatively argued to the courts, first, that King Kong was a part of the public domain, and then second, that King Kong was not part of the public domain, and that Universal possessed exclusive trademark rights in it. Universal's assertions in court were based not on any good faith belief in their truth, but on the mistaken belief that it could use the courts to turn a profit. Because Universal misrepresented their degree of ownership of King Kong (claiming they had exclusive trademark rights when they knew they did not) and tried to have it both ways in court regarding the "public domain" claims, the courts ruled that Universal acted in bad faith (see Universal City Studios, Inc. v. Nintendo Co., Ltd.). They were ordered to pay fines and all of Nintendo's legal costs from the lawsuit. That, along with the fact that the courts ruled that there was simply no likelihood of people confusing Donkey Kong with King Kong, caused Universal to lose the case and the subsequent appeal. Since the court case, Universal still retains the majority of the character rights. In 1986 they opened a King Kong ride called King Kong Encounter at their Universal Studios Tour theme park in Hollywood (which was destroyed in 2008 by a backlot fire), and followed it up with the Kongfrontation ride at their Orlando park in 1990 (which was closed down in 2002 due to maintenance issues). They also finally made a King Kong film of their own, King Kong (2005). In the summer of 2010, Universal opened a new 3D King Kong ride called King Kong: 360 3-D at their Hollywood park replacing the destroyed King Kong Encounter. On July 13, 2016, Universal opened a new King Kong attraction called Skull Island: Reign of Kong at Islands of Adventure in Orlando. In July 2013, Legendary Pictures reached an agreement with Universal in which it will market, co-finance, and distribute Legendary's films for five years starting in 2014, the year that Legendary's similar agreement with Warner Bros. was set to expire. Later, in July 2014 at the San Diego Comic-Con, Legendary announced (product of its partnership with Universal), a King Kong origin story, initially titled Skull Island, with Universal distributing. On December 12, 2014, the studio announced they had re-titled the film Kong: Skull Island. On September 10, 2015, it was announced that Universal would let Legendary Pictures move Kong: Skull Island to Warner Bros., so they could do a King Kong and Godzilla crossover film (in the continuity of the Godzilla movie of 2014), since Legendary Pictures still had the rights to do the two Godzilla sequels with Warner Bros. The Cooper estate (Richard M. Cooper LLC) retains publishing rights for the content they claim. In 1990 they licensed a six-issue comic book adaptation of the story to Monster Comics, and commissioned an illustrated novel in 1994 called Anthony Browne's King Kong. In 2013 they became involved with a musical stage play based on the story, called King Kong The Eighth Wonder of the World which premiered on June 2013 in Australia and then Broadway in November 2018. The production is involved with Global Creatures, the company behind the Walking with Dinosaurs arena show. Starting in 2004, artist/writer Joe Devito began working with the Merian C. Cooper estate to write and/or illustrate various books and comics based on the King Kong character with his company Devito Artworks. These included a pair of origin novels, an origin themed comic series with Boom! Studios, a rewrite of the original Lovelace novelization (the original novelization's publishing rights are still in the public domain), as well as various crossovers with other franchises such as Doc Savage, Tarzan and The Planet of the Apes. Also the company licensed a soft drink with RocketFizz called King Kong Cola and have plans for a live action TV show to be co-produced between MarVista Entertainment and IM Global. In April 2016, Joe DeVito sued Legendary Pictures and Warner Bros, producers of the film Kong: Skull Island, for using elements of his Skull Island universe, which he claimed that he created and the producers used without his permission. RKO (whose rights consisted of only the original film and its sequel) had its film library acquired by Ted Turner in 1986 via his company Turner Entertainment. Turner merged his company into Time Warner in 1996, which is how they own the rights to those two films today, although the copyright over the entire RKO films library (including King Kong and The Son Of Kong) is still held by RKO Pictures LLC. In 2017, Warner Brothers co-produced the film Kong: Skull Island and in 2020 will co-produce the film Godzilla vs. Kong, after Legendary Pictures brought the projects from Universal to their company to build a shared cinematic universe. DDL (whose rights were limited to only their 1976 remake) did a sequel in 1986 called King Kong Lives (but they still needed Universal's permission to do so). Today most of DDL's film library is owned by Studio Canal, which includes the rights to those two films. The domestic (North American) rights to the 1976 King Kong film still remain with the film's original distributor Paramount Pictures, with Trifecta Entertainment & Media handling television rights to the film via their license with Paramount. The two depictions of Kong in the Toho films. In the 1960s, Japanese studio Toho licensed the character from RKO and produced two films that featured the character, King Kong vs Godzilla (1962) and King Kong Escapes (1967). Toho's interpretation differed greatly from the original in size and abilities. Among kaiju, King Kong was suggested to be among the most powerful in terms of raw physical force, possessing strength and durability that rivaled that of Godzilla. As one of the few mammal-based kaiju, Kong's most distinctive feature was his intelligence. He demonstrated the ability to learn and adapt to an opponent's fighting style, identify and exploit weaknesses in an enemy, and utilize his environment to stage ambushes and traps. In King Kong vs. Godzilla, Kong was scaled to be 45 m (148 ft) tall. This version of Kong was given the ability to harvest electricity as a weapon. In King Kong Escapes, Kong was scaled to be 20 m (66 ft) tall. This version was more similar to the original, where he relied on strength and intelligence to fight and survive. Rather than residing on Skull Island, Toho's version resided on Faro Island in King Kong vs. Godzilla and on Mondo Island in King Kong Escapes. King Kong as depicted in the cartoon show. In 1966, Toho planned to produce "Operation Robinson Crusoe: King Kong vs. Ebirah" as a co-production with Rankin/Bass Productions however, Ishirō Honda was unavailable at the time to direct the film and Rankin/Bass backed out of the project, along with the King Kong license. Toho still proceeded with the production, replacing King Kong with Godzilla at the last minute and shot the film as Ebirah, Horror of the Deep. Elements of King Kong's character remained in the film, reflected in Godzilla's uncharacteristic behavior and attraction to the female character Dayo. Toho and Rankin/Bass later negotiated their differences and co-produced King Kong Escapes in 1967, loosely based on Rankin/Bass' animated show. Toho Studios wanted to remake King Kong vs. Godzilla, which was the most successful of the entire Godzilla series of films, in 1991 to celebrate the thirtieth anniversary of the film as well as to celebrate Godzilla's upcoming fortieth anniversary. However they were unable to obtain the rights to use Kong, and inititially intended to use Mechani-Kong as Godzilla's next adversary. But it was soon learned that even using a mechanical creature who resembled Kong would be just as problematic legally and financially for them. As a result, the film became Godzilla vs. King Ghidorah, with no further attempts to use Kong in any way. The King Kong Show (1966) - In this cartoon series, the giant gorilla befriends the Bond family, with whom he goes on various adventures, fighting monsters, robots, mad scientists and other threats. Produced by Rankin/Bass, the animation was provided in Japan by Toei Animation, making this the very first anime series to be commissioned right out of Japan by an American company. The show debuted with an hour-long episode and then was followed by 24 half-hour episodes that aired on ABC. This was also the cartoon that resulted in the production of Toho's Ebirah, Horror of the Deep (originally planned as a Kong film) and King Kong Escapes. Kong: The Animated Series (2000) - An animated production from BKN International set many decades after the events of the original film. "Kong" is cloned by a scientist named Dr. Lorna Jenkins who also used the DNA of her grandson Jason to bring it to life. Jason uses the Cyber-Link to combine with Kong in order to fight evil, allowing Kong to draw on Jason's knowledge of hand-to-hand combat. This show, coming a few years after the release of Centropolis' Godzilla: The Series repeated at least two of the monsters (although with vastly different backgrounds) seen in the Godzilla series. The show ran 40 episodes and aired on Fox Kids. After the series ended, two direct-to-DVD movies were produced. Kong: King of Atlantis, released in 2005 and Kong: Return to the Jungle, released in 2007. The first movie was produced to try and cash in on the 2005 King Kong remake and that same year, Toon Disney's "Jetix" would air not only this movie but the original series as well to also take advantage of the 2005 movie's release. Kong: King of the Apes (2016) - An animated series by 41 Entertainment aired as a Netflix original. The first episode aired as a two-hour movie followed by 12 half-hour episodes. Avi Arad is executive producer of the series. The series synopsis reads "Set in 2050, Kong becomes a wanted fugitive after wreaking havoc at Alcatraz Island's Natural History and Marine Preserve. What most humans on the hunt for the formidable animal do not realize, though, is that Kong was framed by an evil genius who plans to terrorize the world with an army of enormous robotic dinosaurs. As the only beast strong enough to save humanity from the mechanical dinos, Kong must rely on the help of three kids who know the truth about him." King Kong of Skull Island (2019) - An upcoming live action series based on Joe Devito's book of the same name, which was produced with the Merian C. Cooper estate. It is being developed by Stacy Title and Jonathan Penner (The Bye Bye Man). The premise of a giant gorilla brought to the United States for entertainment purposes, and subsequently wreaking havoc, was recycled in Mighty Joe Young (1949), through the same studio and with much of the same principal talent as the 1933 original. It was remade in 1998. 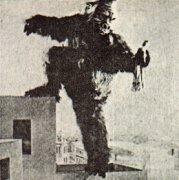 King Kong bears some similarities with an earlier effort by special effects head Willis H. O'Brien, The Lost World (1925), in which dinosaurs are found living on an isolated plateau. The Mighty Kong, a direct to video 1998 animated musical remake of the 1933 film. It featured the voices of Jodi Benson as Ann Darrow and Dudley Moore as Carl Denham. This film also featured a song score by the Sherman Brothers. At the end of the film, King Kong falls from the Empire State Building after getting out of the net that the blimps were using on him. Due to this being a family film, King Kong survives the fall. Banglar King Kong – An unofficial Bangladeshi musical based on the King Kong story and directed by Iftekar Jahan. The film uses large amounts of stock footage from King Kong and premiered in June 2010 in the Purnima Cinema Hall in Dhaka. The 1949 American comedy film Africa Screams, where a giant ape briefly appears. The 1961 British film Konga, where a chimpanzee is enlarged after being fed a growth serum by a deranged scientist and attacks London. The 1969 American film The Mighty Gorga, which features a circus owner's quest to capture a giant gorilla in an African jungle. Unlike King Kong, Gorga remains in Africa. The 1976 Korean 3D film Ape, where a giant ape runs amok in Seoul, South Korea. The 1976 British film Queen Kong, a film that parodies King Kong with a gender reversal between the giant ape and the object of the ape's affection. The 1977 Hong Kong film The Mighty Peking Man, featuring a huge Bigfoot/ape-like creature that attacks Hong Kong after it was brought to Hong Kong from its territory somewhere in India near the Himalayas. The 1977 Italian film Yeti: The 20th Century Giant, featuring a giant abominable snowman running amok in Ontario after a millionaire industrialist thaws it out of a block of ice. The 2018 American film Rampage, featuring a giant albino western lowland gorilla named George. The film is based on the 1986 arcade game Rampage. There were other movies to have borne the "King Kong" name that have nothing to do with the character. A lost silent Japanese short, Japanese King Kong (和製キングコング, Wasei Kingu Kongu), directed by Torajiro Saito, featuring an all-Japanese cast and produced by the Shochiku company, was released in 1933. The plot revolves around a down-on-his-luck man who plays the King Kong character in a vaudeville theater to earn money to woo a girl he likes. The film does not actually involve King Kong per se. King Kong Appears in Edo (江戸に現れたキングコング, Edo ni Arawareta Kingu Kongu). A lost two-part silent Japanese period piece that was produced by a company called Zensho Kinema in 1938. The film revolves around kidnapping and revenge amongst the characters. The "King Kong" in this film is a trained ape (that looks more like a Yeti) who is used to kidnap one of the characters. Judging by the plot synopsis presented by periodicals at the time, the "King Kong" is regular-sized and is only depicted as gigantic on the advertisements for promotional purposes. The 1959 Hong Kong film King Kong's Adventures in the Heavenly Palace which featured a normal-sized gorilla. The Hindi films King Kong (1962) and Tarzan and King Kong (1965) which featured the professional wrestler King Kong and has nothing to do with the famous movie monster, although the latter film featured a normal-sized gorilla. The 1968 Italian film Kong Island (Eva, la Venere selvaggia, literally Eve, the Wild Woman) which was advertised in the U.S. as King of Kong Island. Despite the American title, the film featured normal-sized gorillas and takes place in Africa. The 1981 Mexican film Las Muñecas Del King Kong (The Dolls of King Kong) which featured exotic jungle girls. The "King Kong" in the film was simply a giant ape statue on top of a building. In Mad Monster Party?, the giant gorilla "It" (with the vocal effects provided by Allen Swift) is a larger knock-off of King Kong and is most likely named "It" due to copyright reasons. Baron Boris von Frankenstein didn't send an invite to "It" since "It" can be a bore and had crushed the Isle of Evil's wild boars the last time "It" was invited, as he explained to his assistant Francesca. Boris has his zombies patrol the island just in case "It" shows up uninvited. When "It" does show up, it goes on a rampage and snatches up the monsters and Francesca (where "It" develops a crush on her) and climbs the Isle of Evil's tallest mountain. Boris convinces "It" to take him instead of Francesca which "It" complies to. After Francesca is off the island with Boris' nephew Felix Flanken, Boris sacrifices his life where he drops the vial containing the secret of destruction which destroys himself, "It," the Isle of Evil, and everyone else that was on it at the time. Kong appeared in a Netflix original called Tarzan and Jane (TV series). He first appeared at the end of season 2 episode 4 the ruins. In Mad Mad Mad Monsters (a "prequel of sorts" to Mad Monster Party? ), there was a knock-off of King Kong called Modzoola. The corpse of the 1976 King Kong makes an unauthorized appearance in the film Bye Bye Monkey. King Kong appears in the 1996 Imax film Special Effects: Anything Can Happen. In this film, the classic climax of the 1933 film is recreated with modern (at the time) digital special effects. King of the Lost World (a direct-to-video movie produced by The Asylum) taking elements from both King Kong and Sir Arthur Conan Doyle's The Lost World. The film was released on December 13, 2005, just one day before the theatrical release of Peter Jackson's version of King Kong. The Gigantopithecus is a giant ape that appeared in the 2005 movie King of the Lost World (a loose adaptation of The Lost World by Sir Arthur Conan Doyle). It is estimated to be 9.8 feet (3 m) high and has an interest in attacking intruders, as it threw a flight attendant in the beginning of the movie. It eventually got intimidated when a plane chases it with a torch. Kong appears in the Where My Dogs At? episode "Buddy and Woof Do the MTV Movie Awards." He appears on the stage background at the MTV Movie Awards hosted by Jimmy Fallon (who was the back-up host after Dave Chappelle slipped on a banana peel during his intro and had to be taken to the hospital). After Jimmy Fallon makes a comparison of King Kong and Jack Black after Jessica Simpson gave birth to Jack Black's child, King Kong ended up crushing Jimmy Fallon with his fists much to everyone's delight. When the MTV Movie Awards are over, King Kong gets out of his shackles and heads home. In the 2017 film The Lego Batman Movie, King Kong (voiced by Seth Green) appears as an inmate of the Phantom Zone. He is among the Phantom Zone inmates that Joker releases in order to take over Gotham City. During Joker's campaign, King Kong destroys one of the towers that Batman and the others hide in. With help from Robin, Batgirl, Alfred Pennyworth, and his enemies, Batman is able to defeat King Kong and send him and his fellow Phantom Zone inmates back to the Phantom Zone. In the 2018 film Ready Player One (based on the book of the same name), King Kong appears as one of the hazards of the OASIS racetrack alongside the Tyrannosaurus from the Jurassic Park films. In the film, he is placed at the end of the racetrack near the Empire State Building and it is impossible for the racers to get by him. This prompts the protagonist Wade Watts ("Parzival" in the video game) to search for a solution in James Halliday's life to a dialogue which urges him to go backwards traveling through the code of the game, in a tunnel which starts at the base of the Statue of Liberty and ends behind King Kong at Central Park where the finish line is. A handheld game in 1982 in both a regular edition and a large screen edition. The regular edition was later reissued by Tandy in 1984. A color "Flip-Up" game in 1984. Konami released 2 games based on the film King Kong Lives in 1986. The first game was King Kong 2: Ikari no Megaton Punch for the Famicom, and the second was King Kong 2: Yomigaeru Densetsu, for the MSX computer. In 1988, Konami featured the character in the crossover game Konami Wai Wai World. All these games were only released in Japan. Data East released a pinball game called King Kong-The Eighth Wonder of the World in 1990. In 1992, Nintendo produced an educational game called Mario is Missing that features a treasure hunt level involving King Kong in New York City. The character is represented by images of his arm grabbing the Empire State Building in the NES version and a full body statue in the SNES version. Bam! Entertainment released a Game Boy Advance game based on Kong: The Animated Series in 2002. MGA Entertainment released an electronic handheld King Kong game (packaged with a small figurine) in 2003. Majesco Entertainment released a Game Boy Advance game based on the straight to video animated film Kong: King of Atlantis in 2005. In 2005, Ubisoft released 2 video games based on the film King Kong. Peter Jackson's King Kong: The Official Game of the Movie was released on all video game platforms, while Kong: The 8th Wonder of the World was released for the Game Boy Advance. Also to tie into the film, Gameloft released King Kong: The Official Mobile Game of the Movie for mobile phones, while Radio Shack released a miniature pinball game. Taiyo Elec Co released a King Kong Pachinko game in 2007. King Kong has been featured in various online casino games. NYX gaming developed a King Kong online video slot casino game in 2016. In 2017, Ainsworth Game Technology developed 2 licensed King Kong casino games. King Kong and Kong of Skull Island, while in 2018, NExtGen Gaming released a game called King Kong Fury. King Kong appears in the Warner Bros. Interactive Entertainment game Lego Dimensions. He appears as a boss in The Lego Batman Movie pack. Besides starring in his own games, King Kong was the obvious influence behind other gigantic city destroying apes, such as George from the Rampage series, Woo from King of the Monsters (who was modeled after the Toho version of the character), and Congar from War of the Monsters. As well as giant apes worshiped as deities like Chaos and Blizzard from Primal Rage. King Kong, as well as the series of films featuring him, have been featured many times in popular culture outside of the films themselves, in forms ranging from straight copies to parodies and joke references, and in media from comics to video games. 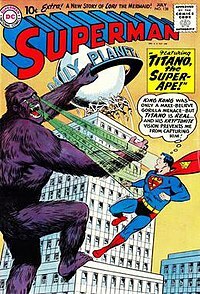 The DC Comics character Titano is clearly modeled on King Kong (here seen climbing the Daily Planet building and confronting Superman). From Superman #138. Art by Curt Swan and Stan Kaye. The Beatles' 1968 animated film Yellow Submarine includes a scene of the characters opening a door to reveal King Kong abducting a woman from her bed. The Simpsons episode "Treehouse of Horror III" features a segment called "King Homer" which parodies the plot of the original film, with Homer as Kong and Marge in the Ann Darrow role. It ends with King Homer marrying Marge and eating her father. The British comedy TV series The Goodies made an episode called "Kitten Kong", in which a giant cat called Twinkle roams the streets of London, knocking over the British Telecom Tower. The controversial World War II Dutch resistance fighter Christiaan Lindemans — eventually arrested on suspicion of having betrayed secrets to the Nazis — was nicknamed "King Kong" due to his being exceptionally tall. Frank Zappa and The Mothers of Invention recorded an instrumental about "King Kong" in 1967 and featured it on the album Uncle Meat. Zappa went on to make many other versions of the song on albums such as Make a Jazz Noise Here, You Can't Do That on Stage Anymore, Vol. 3, Ahead of Their Time, and Beat the Boots. The Kinks recorded a song called "King Kong" as the B-side to their 1969 "Plastic Man" single. In 1972, a 550 cm (18 ft) fiberglass statue of King Kong was erected in Birmingham, England. The second track of The Jimmy Castor Bunch album Supersound from 1975 is titled "King Kong". Filk Music artists Ookla the Mok's "Song of Kong", which explores the reasons why King Kong and Godzilla should not be roommates, appears on their 2001 album Smell No Evil. Daniel Johnston wrote and recorded a song called "King Kong" on his fifth self-released music cassette, Yip/Jump Music in 1983, rereleased on CD and double LP by Homestead Records in 1988. The song is an a cappella narrative of the original movie's story line. Tom Waits recorded a cover version of the song with various sound effects on the 2004 release, The Late Great Daniel Johnston: Discovered Covered. ABBA recorded "King Kong Song" for their 1974 album Waterloo. Although later singled out by ABBA songwriters Benny Andersson and Björn Ulvaeus as one of their weakest tracks., it was released as a single in 1977 to coincide with the 1976 film playing in theatres. Universal Studios has had popular King Kong attractions at Universal Studios Hollywood in Universal City, California and Universal Orlando Resort in Orlando, Florida. The first King Kong attraction was called King Kong Encounter and was a part of the Studio Tour at Universal Studios Hollywood. Based upon the 1976 film King Kong, the tour took the guests in the world of 1976 New York City, where Kong was seen wreaking havoc on the city. It was opened on June 14, 1986 and was destroyed on June 1, 2008 in a major fire. Universal opened a replacement 3D King Kong ride called King Kong: 360 3-D that opened on July 1, 2010, based upon Peter Jackson's 2005 film King Kong. A second more elaborate ride was constructed at Universal Studios Florida on June 7, 1990, called Kongfrontation. The ride featured a stand-alone extended version of King Kong Encounter and pinned guests escaping on the Roosevelt Island Tramway from Kong who was rampaging across New York City. The ride was closed down on September 8, 2002, and was replaced with Revenge of the Mummy on May 21, 2004. On May 6, 2015, Universal Orlando announced that a new King Kong attraction titled Skull Island: Reign of Kong will open at Islands of Adventure in the summer of 2016, making it the first King Kong themed ride in Orlando since Kongfrontation closed down 14 years earlier at Universal Studios Florida. It officially opened on July 13, 2016. A Kong ride made by HUSS Park Attractions also appeared in Changzhou China Dinosaur Park and was opened in 2010. In this ride Kong will pick up you’re wagon lower it down and tilt it all kinds of directions. A man-eating giant gorilla is featured in Henry Rider Haggard's The Holy Flower, a 1915 novel. Sun Wu Kong, king of the rock monkeys. He can change his size, becoming either very big or very small. ^ Lambie, Ryan (March 10, 2017). "The Struggles of King Kong '76". Den of Geek. Retrieved March 28, 2018. ^ Trumbore, Dave (September 19, 2017). "'Transformers': Peter Cullen and Frank Welker on the Evolution of Optimus Prime and Megatron". Collider. Archived from the original on January 30, 2019. Retrieved January 30, 2019. ^ "Kong: Skull Island (2017) End Credits". Legendary Pictures. Archived from the original on June 13, 2017. Retrieved April 9, 2017. ^ Boland, Michaela (February 9, 2009). "Global Creatures takes on "Kong"". Variety. Retrieved March 4, 2010. ^ "Getting That Monkey Off His Creator's Back". New York Times. August 13, 2005. ^ "King Kong (1933) Notes". TCM. ^ a b Vaz 2005, p. 194. ^ a b c d e Goldner & Turner 1975, p. 56. ^ a b Vaz 2005, pp. 193–194. ^ Morton 2005, p. 25. ^ "glosbe.com". Retrieved 18 March 2019. ^ "King Kong Musical Aiming for Broadway in 2013; Creative Team Announced". Playbill. September 16, 2010. Retrieved November 27, 2018. ^ "King Kong Live on Stage at the Regent Theatre, Melbourne". Kingkongliveonstage.com. March 17, 2014. Retrieved January 28, 2015. ^ "The new King of Broadway: Meet the King Kong musical's 2,000-pound puppet". EntertainmentWeekly. November 5, 2018. Retrieved November 25, 2018. ^ "Inside the one-ton, history-making King Kong Broadway musical". SyFy. October 8, 2018. Retrieved December 14, 2018. ^ "'King Kong': The beauty of the beast". Newsday. October 31, 2018. Retrieved November 25, 2018. ^ "KING KONG Published Fiction, Pre-2005. The Original Hardcover". www.fullyarticulated.com. Retrieved June 19, 2016. ^ "Joe DeVito (Creator/Illustrator of Kong: King of Skull Island)". Scifidimensions.com. Archived from the original on March 2, 2011. Retrieved March 4, 2010. ^ "Scans of various reprints of the original novelization". ^ "King Kong unleashed by StarWarp Concepts". flickeringmyth.com. Retrieved February 23, 2017. ^ "King Kong". tebeosfera.com (in Spanish). Retrieved August 11, 2016. ^ Moring, Matthew (January 29, 2012). "Press Release: Doc Savage and King Kong Coming in March" (Press release). Altus Press. Archived from the original on February 18, 2013. Retrieved February 24, 2013. ^ a b "THE ULTIMATE RUMBLE IN THE JUNGLE! : King Kong Vs. Tarzan Arrives This Summer!". Forces of Geek. March 9, 2016. Retrieved March 9, 2016. ^ "FOG! Chats With Author/Artist Joe DeVito About His 'King Kong of Skull Island' Kickstarter". Forces of Geek. March 3, 2017. Retrieved March 16, 2017. ^ "Official Kong: Skull Island Art Book and Movie Novelization announced!". Scified.com. September 1, 2016. Retrieved December 2, 2016. ^ a b "1933 RKO Press Page Scan". ^ Van Hise 1993, p. 66. ^ Morton 2005, p. 36. ^ "King Kong- Building a Shrewder Ape". ^ Franich, Darren (July 30, 2016). "Kong: Skull Island director promises 'the biggest Kong that you've seen on screen'". Entertainment Weekly. ^ Smith, C. Molly (November 11, 2016). "Kong: Skull Island unleashes exclusive first look at the movie monster'". Entertainment Weekly. ^ "Kong: Skull Island Production Notes And High-Res Photos". ScifiJapan. February 19, 2017. ^ Vaz 2005, p. 277. ^ Vaz 2005, p. 361. ^ a b Vaz 2005, pp. 362,455. ^ Vaz 2005, p. 362. ^ a b Vaz 2005, pp. 363,456. ^ a b Vaz 2005, p. 386. ^ Morton 2005, p. 158. ^ a b Vaz 2005, p. 387. ^ a b Vaz 2005, p. 388. ^ a b c Vaz 2005, p. 389. ^ "Universal City Studios v. Nintendo Co., 578 F. Supp. 911 (S.D.N.Y. 1983)". Justia US Law. December 22, 1983. ^ According to Mark Cotta Vaz's book on p. 389, and citation 9 on p. 458, this quote is taken from a court summary from the document Universal City Studios, Inc. v. Nintendo Co., Ltd., 578 F. Supp. at 924. ^ Second Court of Appeals, 1986, 77–8. ^ a b Mart, Hugo (January 27, 2010). "| King Kong to rejoin Universal tours in 3-D". Latimes.com. Retrieved March 4, 2010. ^ "Skull Island: Reign of Kong Coming to Universal Orlando in 2016". Comingsoon.net. Retrieved May 6, 2015. ^ Kit, Borys (September 10, 2015). "'Kong: Skull Island' to Move to Warner Bros. for Planned Monster Movie Universe". The Hollywood Reporter.com. Retrieved September 21, 2015. ^ Gill, Raymond (September 18, 2009). "Kong Rises in Melbourne". Theage.com.au. Retrieved March 4, 2010. ^ "King Kong live on Stage Official Website". Kingkongliveonstage.com. Retrieved March 4, 2010. ^ "Robotic King Kong to star in stage musical". CBC News. September 16, 2010. ^ "Asmus & Magno Take a Monstrous Trip with "Kong of Skull Island"". Comic Book Resources. April 8, 2016. Retrieved April 8, 2016. ^ "Kong On The Planet Of The Apes: Exclusive First Look At The Comic Mini-Series". Empire. Retrieved November 8, 2017. ^ "Soda Pop Labels of Fame". Retrieved April 3, 2018. ^ "'King Kong Skull Island' TV Series in the Works". TheHollywoodReporter. April 18, 2017. Retrieved April 21, 2017. ^ Morton 2005, pp. 239, 241. ^ "King Kong Stats Page". ^ "King Kong (2nd Generation)". ^ "Lost Project: Operation Robinson Crusoe: King Kong vs. Ebirah". Toho Kingdom. Retrieved October 16, 2014. ^ "Netflix sets plans for animated series 'Kong - King of the Apes'". Entertainment Weekly. October 1, 2014. Retrieved October 1, 2014. ^ "King Kong Female-Led TV Series In Works At MarVista Entertainment & IM Global TV". Deadline. April 19, 2017. ^ The Ongoing Travels of King Kong. Roberthood.net (June 11, 2010). Retrieved on December 21, 2012. ^ 高槻真樹 (Maki Takatsuki) (2014). 戦前日本ＳＦ映画創世記　ゴジラは何でできているか (Senzen Nihon SF Eiga Souseiki) (in Japanese). 河出書房新社 (Kawadeshobo Shinsha publishing). pp. 183–188. ^ "King Kong's Adventures in the Heavenly Palace". ^ Sprague, Mike (December 12, 2017). "Did You Catch Chucky and King Kong's Cameo in the Trailer For Steven Spielberg's New Movie?". DreadCentral. Dreadcentral.com. Retrieved December 13, 2017. ^ "Tiger King Kong". Handheldmuseum.com. Retrieved March 4, 2010. ^ "King Kong (US) Box Shot for Atari 2600". GameFAQs. June 2, 2009. Retrieved March 4, 2010. ^ "Tiger King Kong LCD". Handheldmuseum.com. Retrieved March 4, 2010. ^ "Tiger King Kong Large Screen". Handheldmuseum.com. Retrieved March 4, 2010. ^ "Tandy King Kong LCD". Handheldmuseum.com. Retrieved February 11, 2011. ^ "Tiger King Kong (Orlitronic)". Handheldmuseum.com. Retrieved March 4, 2010. ^ "Tiger King Kong Color". Handheldmuseum.com. Retrieved March 4, 2010. ^ "Grandstand King Kong New York". Handheldmuseum.com. Retrieved March 4, 2010. ^ "Epoch King Kong Jungle". Handheldmuseum.com. Retrieved March 4, 2010. ^ "King Kong 2 Box Shots and Screenshots for MSX". GameFAQs. June 2, 2009. Retrieved March 4, 2010. ^ "The Internet Pinball Machine Database". Ipdb.org. November 20, 1931. Retrieved March 4, 2010. ^ "Kong: The Animated Series (US) Box Shot for Game Boy Advance". GameFAQs. June 2, 2009. Retrieved March 4, 2010. ^ "Kong: King of Atlantis (US) Box Shot for Game Boy Advance". GameFAQs. June 2, 2009. Retrieved March 4, 2010. ^ "King Kong: The Official Game of the Movie Review". gamespot.com. December 15, 2005. ^ "Radio Shack KING KONG Electronic Pinball Toy Game". worthpoint.com. ^ "Win Real Money with Prime Slots – King Kong 5 Reel Slot!". Primeslots.com. November 12, 2016. Retrieved November 12, 2016. ^ "King Kong video slot by NYX". Bestnetcasino. November 12, 2016. Retrieved November 12, 2016. ^ "King Kong video slot by Ainsworth". Agtslots. Archived from the original on August 19, 2017. Retrieved August 18, 2017. ^ "AINSWORTH continues momentum at ICE 2017". casinocompendium. Retrieved August 18, 2017. ^ "NextGen Gaming Set Release Date for Upcoming King Kong Fury™ Slot". casinoplayersreport.com. Retrieved March 14, 2018. ^ "The Creator of Rampage Reveals the Game's Undiscovered Easter Egg and Gushes about The Rock". syfywire. Retrieved April 12, 2018. ^ Hinsley, F. H.; Simkins, C. A. G. (1990). British Intelligence in the Second World War: Volume 4, Security and Counter-Intelligence. Cambridge University Press. p. 373. ^ "AllMusic". Retrieved August 20, 2013. ^ "Badass New Teaser Promo for Universal's New King Kong Ride". Dreadcentral.com. Retrieved March 4, 2010. ^ "King Kong Roars to Life in Groundbreaking new Attraction". blog.universalorlando.com. Retrieved May 6, 2015. ^ West, Mike (13 July 2016). "Now Open - Skull Island: Reign of Kong". Universal Orlando Close Up. Universal Orlando Resort. Retrieved 14 September 2016. Goldner, Orville; Turner, George E. (1975). The Making of King Kong: The Story Behind a Film Classic. A.S Barnes and Co. Inc.
Van Hise, James (1993). Hot Blooded Dinosaur Movies. Pioneer Books Inc.
Wikimedia Commons has media related to King Kong.